Rhona Levy of the Bronx, NY got what she described as “sort of like an early Christmas present” — the right to be interred with her beloved pets who have passed on. New York’s state cemetery board has ruled that humans may now arrange for burial at Hartsdale Pet Cemetery and Crematorium, reversing a ruling from the summertime that prohibited the practice. 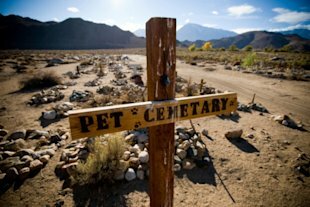 The ban apparently had to do with the non-profit tax status of human cemeteries and memorial parks, but humans who had planned their post-lives to include the companionship of their pets protested. Now Hartsdale — the nation’soldest and largest pet cemetery, with over 70,000 companion animals (and 700 humans) making it their final resting place — can again allow owners to be laid to rest alongside beloved pets, as long as they do not advertise, or charge for, that service.Hartsdale, founded in 1896 by veterinarian Dr. Samuel Johnson, is no doubt a lovely facility, but we’re not sure we’d describe the ability to go there after death as a “gift,” so much as a somewhat unhealthy attempt to control death and grief. But everybody’s relationships with their pets — and their grieving processes — are different, and Levy isn’t the only one who appreciates the lifting of the embargo; the New York Post quotes Taylor York as feeling relieved that her late uncle, NYPD officer Thomas Ryan, can be laid to rest at Hartsdale beside his wife and their Maltese dogs. If a family member made such arrangements, we’d have no problem with it; we’d honor their wishes. But it’s not something we’d do for ourselves, and we’d have a tough time not making “mew-soleum” jokes. And we definitely have to draw the line at pet seances. Adele, who just had successful surgery on her vocal chord, was seen for the first time outside her London home with her dog; a Dachshund named, “Louie,”who was seen peeking out of his dog carrier. Paul McKinlay saw Scamp, his 8-month-old Yorkie-Shih Tzu mix, slip under the fence and run to the dark and winding road in Washington state earlier this month. He ran to get his pup, but then he heard it. The sickening thud, the yelp, then nothing. The dog he and his wife had earlier this year given their 6-year-old twin grandchildren, who live with them, was unresponsive. Blood. Fixed eyes. No breath. No heartbeat. The woman who hit him was crying. McKinlay and his wife were devastated. They wrapped the dog, Scamp, in a blanket, placed him under an overturned wheelbarrow, and went to tell the twins. The kids went off to another relative’s house the next day, and Paul McKinlay went to bury Scamp. He lifted up the wheelbarrow and there was Scamp. But he wasn’t still wrapped in the blanket. He was sitting up, clearly injured, but very much alive. The McKinlays rushed him to the veterinary hospital, where he was found to have a bad concussion, bruises, broken teeth and a possible hairline jaw fracture.